Brown: Championing a coordinated global structure for the financial services industry. 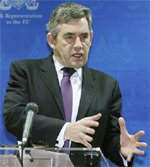 Prime minister Gordon Brown has been ridiculed in the British press for calling for a new Bretton Woods summit. He has been accused of political posturing at home, as well as grandstanding on the world stage. Brown engineered a British bank bailout scheme that served as a pattern for European and US bank recapitalizations. He also announced government guarantees for interbank loans to get credit flowing again. But his domestic critics say the British economy is in a mess, largely as the result of errors Brown made as chancellor of the Exchequer. Brown’s ideas are getting a much better reception abroad than they are in the UK. First, EU leaders last month agreed at a summit in Brussels to back Brown’s call for a new global financial order founded on transparency and responsibility. “I think that what we are looking for is an International Monetary Fund that is more like an independent central bank,” Brown said at the EU summit. He called for a cross-border mechanism to monitor the world’s 30 largest financial institutions. 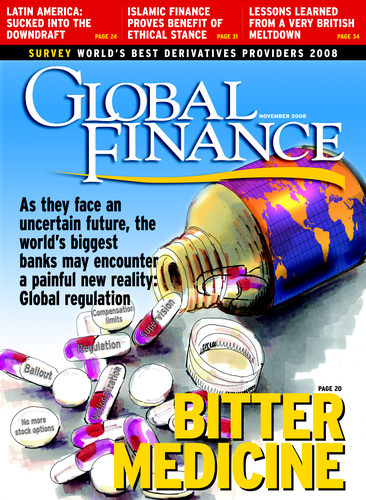 Then, EU leaders convinced US president George Bush in a meeting at Camp David on October 18 to host world leaders at an economic summit, perhaps as early as this month, to reform the world financial system. “We will work to strengthen and modernize our nations’ financial systems so we can help ensure that this crisis doesn’t happen again,” Bush said. The meeting of heads of developed and developing countries will be held in the US soon after the November 4 general election. Say what you may about Gordon Brown, a consensus has developed on the need for cooperation and coordination at the very least as a result of the global financial crisis.